1st – Bama Quail Club OSD 58 x 10 = 580 1,960 pts. 3rd – Bama Quail Club OSD 58 x 3 = 174 1,624 pts. RU – Northeaster OSD CH 52 x 5 = 260 1,560 pts. 2nd – East AL Herman Smith Mem. OSD CL 52 x 5 = 260 1,315 pts. 3rd – Vidalia FTC Beaver Creek OSD CL 34 x 3 = 102 1,022 pts. CH – Middle Atlantic OSD CH 26 x 10 = 260 900 pts. 2nd – Fleetwood OSD CL 26 x 5 = 130 875 pts. 3rd – Garden State OSD CL 33 x 3 = 99 875 pts. 1st – Vidalia FTC Beaver Creek OSD CL 34 x 10 = 340 720 pts. 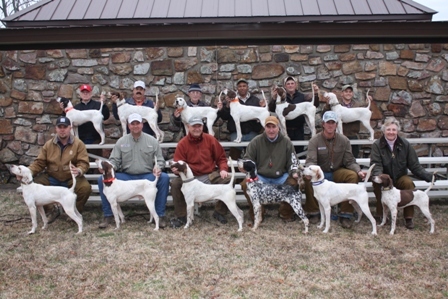 2nd – North Carolina Open Pointing Dog Assn. 31 x 5 = 155 675 pts. RU – National Pheasant OSD CH 54 x 5 = 270 640 pts. CH – Northeastern OSD CH 52 x 10 = 520 520 pts. I had thought I was a full-fledged member of the Triple A Club (Age, Arthritis, and Apathy) and my 21- and 27-year old horses qualified for at least the Double A. But, the phone rang one day, and it was not a credit card solicitation or someone asking, “Is this the dog pound?” Joyce Taylor was on the line, requesting my services as scribe for the United States Shooting Dog Invitational, a pleasant and rewarding position I had filled on three previous occasions. In 2006, it was a privilege to watch Elhew Sunflower in a genuinely unforgettable performance on the final day, to capture her last title before retirement. Serious Threat was hero of the three days in 2007, and in 2009, another female pointer, Dogwood Meg, was the big winner. Sooo, it was with a sigh of regret that I informed Joyce that neither my knees nor my horseflesh were up to the task of the arduous riding of my preferred reporting style. What a wonderful decision the Executive Committee made in allowing me to report from the Dog Truck! To seal the deal, the judges they had secured were two “old buddies” of mine, Jack Herriage and Tom Milam, with whom I knew I could confer and pester with questions. Until you have attended an Invitational, there’s no way to fully comprehend the “specialness” of the event. When the full page advertisement comes out in the American Field Magazine with the listing of the invitees, you might appreciate the quality of the competition, as only the top 12 Purina point-earners from the previous season are initially on that list; but, do you take the time to study the long listing of sponsors and benefactors and their contributions? Or make note of the $7000 purse (next year to be $7500) in just a 12 dog stake? Or realize that each of those 12 canine athletes must run one-hour heats two consecutive days, and a ninety-minute race, if the callbacks are attained, on the third day? And there is simply no way to convey on the printed page the air of festivity that the hosts engender with their enthusiasm and hospitality. Thanks to Audrey, Jack and Brian Sanchez joining other Invitational benefactors, Lee Cruise, Linda and Charlie Jackson, Lynn and Randy Potter, and Joyce and Johnny Taylor, to ensure a generous endowment is in place it was announced that the Invitational purse will be increased to $7,500 next year. This is a remarkable purse considering this is only a 12 dog field with entry fees of $300. The Invitational entry fee has not been raised for longer than memory will allow, over 25 years. It is the aim of the Invitational host to keep the entry fee of the Championship as affordable as possible. They operate under the belief that this competition should honor the competitor and that they should not be burdened with a large entry amount for that earned privilege. Too, they feel that a substantial purse is warranted at a trial of the ‘best-against-the best’, ‘the top 12 dogs in the nation’, as per proven performance and are aggressive in their approach to see that the purse will continue to increase. Another of the unique pleasures of the Invitational is getting to meet owners and handlers from far flung parts of the country – no – continent!, and of course the opportunity to watch the great dogs they bring with them. Friday evening’s festivities mainly concern getting acquainted, introductions of the handlers and owners present, and the handing out of Invitational- inscribed caps, vests, shirts and sweatshirt hoodies to all of them and the judges. Each handler received a leather dog collar by Leather Brothers with a name plate for his entries and a bag of Purina Pro-Plan dog food per entry. The owners were presented with copies of Robert Wehle’s inspirational book Wing and Shot courtesy of Ella Shultz and Country Press. Only four of the competing dogs’ owners were unable to attend, and the others came from the states of Pennsylvania, New York, Minnesota, South Carolina and Ohio, and Ontario, Canada. Special presentations were made to handlers Mike Tracy and Shawn Kinkelaar for attaining the ten-year attendance mark in invitations. Acknowledgement to scouts Eddy Taylor and Mark McClain was also included, for their time and hard work. All of this happened after a cocktail party hosted by Carol and Witt Stephens and Don and Ginger Kidd and a delicious catered barbecue dinner. Judges of previous Invitational runnings were introduced, E.J. Hall and Bill Richards, both of whom brought their wives and rode for this entire trial; then the judges for this reprisal, Tom Milam and wife Linda from Texas and Jack Herriage and wife Peg from Arkansas. Tom is a seasoned campaigner of both Brittanys and pointers, with champions in his kennel; Jack has won this very Invitational Championship twice in the past, 1992 with Muddy’s Princess and 1995 with Fiddler’s Shining Gold. An especially big round of applause was aimed at Roy Pelton, our friendly Purina representative. It would be difficult to maintain the top-notch reputation of this event without the generous sponsorship of the Purina Company. At long last the final business of the evening, maybe the most important of all – the drawings for bracings for the Saturday and Sunday running. With Mike Tracy the handler of a record six of the contenders, it was a given that he would be in every brace every day, so the pairings for day one were not too difficult. Day two was a challenge, as the dogs are traditionally drawn to run the opposite time of day as on day one. Saturday night, the mood was still festive, with an underlying buzz about the performances of the day and the terrific amount of bird work tallied up, 26 total coveys and the record-setting nine-contacts by Our Big Bully. The catered catfish dinner was devoured appreciatively and quickly, so that more fun could be had. More past judges were in attendance this evening, Larry Garner, who also represents Spalding Fly Predators among others; Buzzy Daugherty, not only a past judge but also winning handler in 1990 with Carden Bottom Lady; and Gordon Hazelwood, previous judge and winner of a rare Runner-Up slot in 1992 with Chickalah Cowboy and then Champion in 2000 with Southwind Mickey. Gordon and his wife Cindy also sponsor the Montana Silvermith’s belt buckle to be awarded to the owner of the winner this year. Neil Mace, recent transplant from Tennessee to Arkansas, was given a round of applause for reporting the Invitational on two previous occasions and all the other help he has given. Noticeably missing from the crowd this year were usual annual attendees retired pro trainers Bill Trabue of Oklahoma for health reasons and Delmar Smith, also from Oklahoma, on business elsewhere. Two really special presentations were made on Saturday evening, both to the owners of the 2011 winner of the Shooting Dog Invitational, Jack and Brian Sanchez. The stunningly beautiful oil painting of Great River Ice, compliments of Purina, was unveiled by the artist himself, Ross Young, who was in the gallery with us the next day. Rita Ornsby, artist and creator of a large wooden chest decorated with wood-burned hunting scenes and the name of the dog, was next on stage to present to the Sanchez family. Then, followed another en-masse giveaway, with Gift Certificates to Gun Dog Supply, sets of leather reins from Heskitt Saddle Works and SportDOG Wax-Coated hats to handlers; Gun Dog Supply Certificates and SportDOG Hats to owners; and Gun Dog Supply Certificates and Purina fleece-lined vests to the judges and reporter. Then, an auction was held for a unit donated by Astro Garmin, with the very latest technology for keeping track of our dogs, children or whatever we put it on! By Sunday evening, the crowd had thinned out only a little, and the anticipation was sharp in the air. Appetites were also sharp for the home-cooked steaks and fixin’s, courtesy of last year’s winners Jack and Brian Sanchez, the Championship hosts prepared for us. Time for more presents! Larry Garner took the podium to give a brief explanation of how Spalding Fly Predators work and then passed out certificates for a year’s supply of the little beasties to each handler and owner. Names were put in a hat and drawn out for the many doorprize giveaways from various sponsors including: Wilcox Feed, Cagle Saddle Company, Jack Haggis, The Collar Clinic, Bird Dog Sipping Whiskey (as endorsed by Sean Connery in a movie Johnny Taylor watched late one night! ), Tri-Tronics, Bye Bye Odor, Nutramax, Country Press, and SportDOG with a training collar and bark collars and nutritional supplements. Three more unique and valuable wood-carvings done on cypress knees (roots) by Rita Ornsby were given away, a lovely ladies silver belt buckle by Julie Martin and a very realistic wood sculpture by artist Johnny Kirtley. The “big daddy” special door prize was a SportDOG satellite tracking/training collar, valued at $650. More guests of the evening were The Snell brothers, owners of a special sponsor, Gun Dog Supply, and they were mounted Monday morning to watch the exciting finals. Johnny Taylor is a terrific emcee, and Joyce a great organizer. They both also ride every brace and marshall. Johnny and Rita Ornsby co-host, co-organize, and also ride and marshall. More good helpers this year were Connie Crowell for work in the kitchen but especially with her hidden talent at herding trail riders, and Dave Dosch for marshalling and whatever was asked of him. 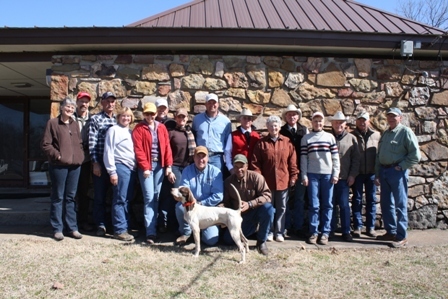 Members of the Arkansas Amateur Field trial Association also gave help as needed. The Crowells, Art and Connie, also sponsored all the caps given away, with Purina. The whole field trial nation is grateful to the state of Arkansas for their special Game and Fish Commission’s dedication to maintaining wildlife management areas in which we can pursue our sport. Camp Robinson area manager Roger Martin was my “driver” on Sunday and Monday, and his assistant Josh Fortner on Saturday. Both men knew exactly where each brace would end, where to expect the dogs to pop out for viewing purposes, and where every covey was supposed to be. They put that green 4-wheel-drive truck through some real slop not only for my benefit but because they both really enjoy watching the dogs. Roger told me they never get to see an issue of The American Field, and I think that should be rectified! With maddening and mischievous intent, Johnny Taylor always leaves for last the announcement of the dogs the judges have chosen to view again in a final series. Would it be two? Four? Any? Totally their choice! Ah, but to the surprise of hardly anyone, there were four particular standouts from the Saturday and Sunday runnings, to be braced thus: Covey Rises’s Offlee Amazin with Great River Ice, and Our Big Bully with The Insider. On Saturday morning, February 18, the temperature at the 8:00 breakaway was around 50 degrees, the sky totally overcast, and little to no breeze. On the line for the initial brace of the championship were Great River Ice , pointer male handled by Mike Tracy for Great River Kennels, Jack and Brian Sanchez were riding this morning along with Casey Foster; and setter male The Insider handled by Shawn Kinkelaar for absentee owner John Fort. Both dogs blasted right off, Ice on a nice cast to the right across the road then on forward, Insider more to the left towards the fence. Both dogs were seen to the front at the ridge at 25. Insider had a bit of a problem with direction for awhile. He scored a find at 42, head held high with pride. Great River Ice ran a big forward race and handled very well, giving strong clues as to why he won this stake last year. He had finds at 24 before the little horseshoe, at 47 and again at 53, all on coveys. He looked handsome and strong each time. The traditional coffee break offered up homemade nutbreads, what a treat! Brace number 2 was away at 9:20 going into the horseshoe, the weather unchanged, the air very damp ; Merrihill’s Carolina (Kinkelaar) with owner Ron Prewitt in the gallery, down with Our Big Bully (Tracy), for Erwin and Karen Saniga, also in the gallery. Carolina got birdy and stopped in the grass at 7, but went on. Bully came through nearby and went on point, for a nice covey find just in front of the trees. Carolina was found on point at 20, but a long relocation could produce nothing. She was turned loose and taken on a shortcut to catch the front; we saw her head over the mountain to the right, and that was the last of her till after the brace was over. Now, wow, listen to this – Bully had finds at 14, 20 and 26, then stops to flush at 29 and 32, then more finds at 44, 48 and 55! With the find early in the hour, that was a total of nine bird contacts in one hour, a record for the Invitational, although not for a stake at Camp Robinson. The stops to flush were where, for instance, once he came around a sharp bend in the trail, wind at his tail, and birds startled away, and he stopped on his own. Perfectly correct behavior. At 44, his slight loss of stature induced Tracy to ask him to relocate, and he himself walked up the birds behind the dog, who stopped as he heard them. Find 48 was off a hillside, and 55 was on the left before the nursery pond. In between all this birdwork, Bully managed to run an easy-handling forward race, if he seemed to be on the trails some, he ended up pointing birds there. The final morning brace was comprised of Covey Rise’s Offlee Amazin (Kinkelaar) and Serious Threat (Tracy) who won this Invitational Championship in 2007 ( five years ago, and he is still a top contender!). Owner Greg Strausbaugh and friend Barbara Wharton brought horses all the way from Pennsylvania to ride and watch their handsome pointer. Amazin’s owners, Gary Hertz and Drs. 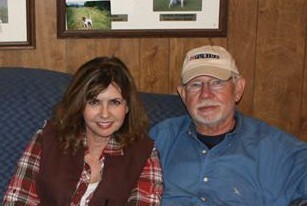 Thomas and Robin Morgan, were unable to be with us. Offlee Amazin scored first at 7 with a covey, and Threat offered a mannerly back; then, just a few hundred yards downcourse, the dogs were again together, and a divided find was awarded as both handlers flushed birds. Serious Threat continued the hour with a hard-working forward race, suffering an unproductive stand at 43. After the first two pieces of work, Offlee Amazin had a few extended absences, in between a big race that filled the country, just a tad bullish. After one absence, when handler and judge had gone to look for the dog, the other judge spied him on point after crossing a ridge and turning right. Scout Mike Hester took the duty of flushing the covey and firing a shot, the dog was perfect, if tired-looking, he’d probably been there awhile! This was at 56, so there was just time for a good cast at the finish. Our gallery for the morning numbered almost 30 riders, a good group for a gloomy day with such a heavy threat of rain. Lunch was yummy spaghetti with salad and veggies, cake for dessert. At the 1 pm breakaway time, skies were still gray, but now, there was a wind slicing through both the air and our jackets. Klee’s Shooting Star (Tracy), another repeat visitor to the Invitational, with owner Andrea Clark mounted, was away with Heaven’s Elhew Taggert handled by Travis Gellhaus in his debut here, with owner David Gates and Jenny Gellhuas also in the gallery. Both dogs were seen at 5 going across the big concrete bridge and in a race up the road. Star was seen again at 10, then unfortunately not again till after pickup. Taggert had a big wild race, not heeding handler much. He had a nonproductive at 20 with a long relocate, just before the cemetery. The dog had been off course and finally rounded up by scout, then went on point. Later he had another nonproductive, then back-to-back finds at 55 and 57, both jam up good, just 150 yards apart, separate bunches of birds. But the 3rd point at 59 was not a charm, turning into the last nonproductive, and the end of the hour. Our fifth hour presented Richfield Silver Belle (Tracy) for owners William and Claudia McNamee, who could not make the trip, down with Tall River Chico (Mike Hester) whose owner Adriano Gazzola was following the dog wagon in his own truck. These two pointers broke away going into the horseshoe and then over the mountain. Chico had a good find at 12, which Belle backed, then another at 37 in tall grass right on course. This might have finally turned him on, because the last half of his race was much more animated and inspired than the first. At 59 we saw him working birdy along the road, the scout came for him but before he was all the way back he went on point, and birds flew. Belle, who had undergone major surgery just last September, ran a strong and willing race. Last brace of the day included Coosawhatchie Chief (Tracy) again for Andrea Clark, and Tall River (Hester) for absent Canadian Don Frigo. Two nonproductives marred Chief’s hustling ground effort, but he closed the hour with a really nice find at 59, right up front. Tall River was very fast and forward but would turn to come back towards handler a lot. He had nonprodutives at 18 at the far southwest end by the gate (rabbit pen) and 30 almost on the road. A good covey find at 47 perked him up. Sunday morning, Day Two, began with “Roger to the Rescue” – today’s dog truck driver and area manager for Arkansas Game and Fish. Roger Martin first of all rounded up a stray dog and put it in a kennel so it wouldn’t follow us around the course, then assisted Linda Milam leading a horse not wanting to go where she wanted it to go. We still loaded dogs and made it to the line for the kick off at 8:05 of Tall River (Hester) and Coosawhatchie Chief (Tracy). Chief was-way- way to the right at first, but achieved the front by himself. He managed to keep himself nicely on course with a minimum of scouting, catching us at the road at 28. Cat crossing at 43 was the site of a nice covey find for Chief, and his finish was strong. Tall River ran a more confident race today, not stopping to check in with handler nearly as much. He was in hand at the top of the mountain for the road crossing. He had a stylish back on a nonproductive of his bracemate’s, and just a minute before time was called, point was called for Tall River on the far side of the newly christened “Sunflower Field” (aka end of the horseshoe pasture). His posture was nicely erect today. About half way through the first hour the sun appeared and burned away the cloud cover, making it a beautiful day to run dogs, work in the garden, or sit in the sun and think about either of the above. After the coffee break, Heaven’s Elhew Taggert (Gellhaus) and Klee’s Shooting Star (Tracy) were away from the mark. Taggert was dead ahead coming out of the horseshoe; he seemed to be a lot more subdued today, more responsive to his handler, much improved over yesterday. He had a picturesque find on a covey in the pines at 10. At 20, both dogs were in hand for the mountain crossing, where they were stopped to water. After this, both dogs went wide to the left, and scouts were dispatched for the roundup. 40 found Taggert on point again, at a tall tree stump covered with briars, but a lengthy relocation was to no avail. He tried to point again at 55, but corrected himself a few times and finally went on. Star was long gone by the half. Breakaway for the final morning hour was from the nursery pond, Tall River Chico (Hester) and Richfield’s Silver Belle (Tracy). Chico was working wide to the right at 15, took himself to the front, and had a good find at 30 in a mowed strip. He pointed, corrected, pointed, corrected, finally pointed and a covey was flushed from the end of the strip; evidently, they had been trying to run out the far end, and he did a good job of trailing them. His race was nice and forward, possibly the best overall performance of the morning. Belle had a covey at 37, in grass in front of a bare tree by the red gate. After the ridge crossing at 40, she was headed to the right instead of up to the firestation corner. With no dog by 50, Tracy asked for the tracker, and she was easily found behind the new horsebarn. We had a nice Sunday dinner of ham and scalloped potatoes and peach cobbler. 1:15 saw us ready on the line with Great River Ice (Tracy) and The Insider (Kinkelaar). Ice had a terrific race today, he went everywhere he was supposed to go, but was birdless. We saw him take a long cast into a meadow and take himself back to the front, then up a hillside and the same, over and over. The Insider had a very improved race from yesterday, much more forward. He had a real stop-to-flush at 11, and then down the mountain from Jack’s parking place on the south side he had a find. Two more good pieces of birdwork kept him busy for the rest of the hour. Our Big Bully (Tracy) and Covey Rise’s Offlee Amazin (Kinkelaar) were let go at 2:25 from Jack’s parking place on the north side of the mountain. Bully had a chance to stretch his legs today and showed us a nice ranging forward race, with no birdwork in the first half. Amazin started out at 4 with a find, then a stop-to-flush at 8. Then, as we approached dead horse corner, almost to nursery pond on the left, he was pointed again. Handler called flight of one bird, judges didn’t see, so handler flushed and flushed. Scout Hester was leading handler’s horse a few steps out of the way (he thought!) when birds flew from under them! Heading along the edge of the nursery pond, Amazin had another find at 33, then just a few hundred yards on up the edge yet another find. Now a mighty effort was made to attain the front, and stay there. Bully finished strong but still birdless. Moving right along with a 3:32 breakaway, Merrihill’s Carolina (Kinkelaar) and Serious Threat (Tracy) took off for their second chance. Carolina applied herself well today and ran a good race. She had a pretty covey find at 20. After rounding behind camp and starting back on the #1 course for a finish, she went far away to the right, clear across the road. Scout was sent, and he called point at 59. It was a long ride over, a long flush, a long relocation – for naught. Serious Threat ran a very serious, threatening (sorry, had to do it) race, hitting the right places and with plenty of energy, but could find no birds. He finished ten minutes into the # 1 course. Another beautiful spring-like morning, cool, slightly breezy, sunny, 8:00 in the morning, some poor folks were sitting at their desks in a stuffy office or working in some other indoor artificially heated and lighted area – but we were at the breakaway point on course number one, watching Great River Ice (Tracy) and Covey Rises’s Offlee Amazin (Kinkelaar) blast off with energy and nerve. Ice was first to be spotted on point at 7, and after a back and forth, back and forth relocation finally established around a pile of brush, and a covey was flushed some fifteen to twenty yards off. Amazin stood a staunch back for this, and again at 19, which turned out to be a nonproductive for Ice. Amazin was the first to cross the road at the top of the hill, and was quickly all the way down and into the bottom heading to the far tree line. Ice crossed over about four minutes later, heading the same way. Amazin scored a nice find in the circle after Cat’s crossing, and this time it was Ice in the honoring position. 51 heard the call of point for Ice, followed quickly by “there go the birds” and a shot, but by the time judges arrived, all to be seen was Ice on point and Amazin backing. Both dogs were led out and encouraged on. Ice had a beautiful find at 60 in the middle of a field. About this time, Amazin’s handler was worried and went off on a long point by the lake to look for him, but the dog was spied by gallery and judges far to the front, about three points ahead. At 70, in the Sunflower Field, Amazin had a good find, and then went on a long cast ahead, to point again at 80 along the ridge by Jack’s parking, for his third and final find. Right at 90, Ice finished up with a find at the little pond known as Buddy’s watering hole. What an exciting hour and a half, in any other trial either dog would easily be the winner. But, we still had Our Big Bully (Tracy) and The Insider (Kinkelaar) set to challenge, and both were up to the task! Insider had a find almost immediately, at 5, around dead horse corner, the dog posed by the cemetery. Then it was Bully’s turn at 27, with a covey. At this time, Insider bore far to the right, handler started after, called point but waved it off and the dog rounded back for the front. At 38, Bully was running the north side of a ridge, handler rode to the dog who was out of sight in a pile of brush and birds flew for all to see, and upon judges’ arrival, the dog was standing nicely. This next bit of work would make a nice painting for Ross Young, and you had to see it to believe it. At the rabbit pens at 56, both dogs were in the general area, and suddenly, Insider whirled and pointed; simultaneously a covey flew, and though he couldn’t see them, Bully immediately stopped – the dogs were standing within a few feet of each other, facing opposite directions – tail to tail as it were – and each likely oblivious of the other’s presence! Shots were fired, and dogs released. Bully finished strong; Insider found an early season woodcock in the brush at 72. What did I say about the first brace? Well ditto for this one, two winning performances if ever there were. The judges had a conversation on the way in, and remember, the performances of each dog from all three days were to carry the weight of their decision. The rest of us enjoyed our final hot lunch of meatloaf and chocolate cake, but there were a couple of handlers undoubtedly with knotted guts awaiting the big announcement. Covey Rise’s Offlee Amazin’s , nicknamed “Braxton,” mother, Elhew Hannabelle, is a former competitor in the Invitational, as was his grand-mother, Elhew Swami, who won the title in the years 2003 and 2004, and his aunt Elhew Sunflower, with a win in 2006. His wins in the previous season to earn qualification were the Southwest Missouri Open Shooting Dog Championship, The Texas Open Shooting Dog Championship, The International Endurance Shooting Dog Championship, and 1st place in the Bama Quail Club Open Shooting Dog. Our Big Bully, so-named for his obnoxious behavior as a puppy, call name “Big,” attained runner-up titles in the Michigan and Canadian Open Shooting Dog Championships, and 1st placements in the Central Alabama Bird Hunters Club Open Shooting Dog, and Keystone Open Shooting Dog, and a 3rd place in the Bama Quail Club Open Shooting Dog. The Insider, “Spec” for short, and appropriately for this heavily ticked English Setter, won the Michigan and the Canadian Open Shooting Dog Championships, and was runner-up in the Northeastern Open Shooting Dog Championship. He is a returning contender to the Invitational. Great River Ice, or “Dan,” won the US Open Shooting Dog Invitational Championship last year, was runner-up in the New England Open Shooting Dog Championship, took 1st place in the Garden State Open Shooting Dog Stake, and 2nd place in the East Alabama Herman Smith Memorial Open Shooting Dog Classic. Heaven’s Elhew Taggert, appropriately called “Tag,” won the Montana and the National Chukar Open Shooting Dog Championships, was runner-up in the Dakota-Saskatchewan Open Shooting Dog Championship, and placed 3rd in the Vidalia Field Trial Club Beaver Creek Open Shooting Dog Classic. Klee’s Shooting Star, “Eva,” also a repeat contender in this Invitational format, earned Championship titles at the South Carolina and Middle Atlantic Open Shooting Dog Championships. Merrihill’s Carolina, call name “Bette” and yet another previous contender in an Invitational, won the title at the Colorado Open Shooting Dog Championship, the runner-up slot at the Egyptian Open Shooting Dog Championship, and placed 2nd in the Fleetwood Open Shooting Dog Classic. 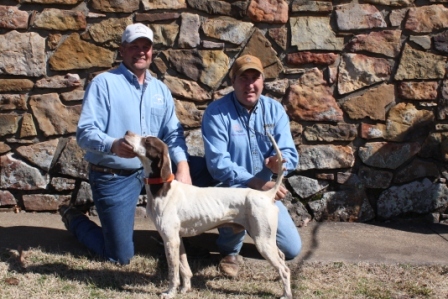 Serious Threat, “Joe,” a former winner of the Invitational title, won the East Alabama Herman Smith Memorial Open Shooting Dog Classic, placed 2nd in the Georgia Association of Field Trial Club’s Open Shooting Dog Classic, and 3rd in the Garden State Open Shooting Dog Club Classic. Tall River Chico, a sassy “Chic,” won the North Carolina Open Shooting Dog Championship and placed 1st in the Vidalia Field Trial Club Beaver Creek Open Shooting Dog Classic. Tall River, “Ben,” won the Kentucky Open Shooting Dog Championship and placed 2nd in the North Carolina Open Pointing Dog Association’s Open Shooting Dog. Coosawhatchie Chief, appropriately called “Chief,” won the Keystone Open Shooting Dog Championship, and was runner up in the National Pheasant Open Shooing Dog Championship. Richfield Silver Belle, the 3rd of only three females in the stake, and called a sophisticated “Sidney,” won the Northeastern Open Shooting Dog Championship. Please take note of the wide geographical scope of the wins of these remarkable dogs, and also note that no less than six of them are repeat invitees, and two of them already carry the Invitational Championship Title on their resumes. To view additional photos from the 2012 Invitational Championship go to the ‘Photo Gallery’ tab on the Home page and select ‘2012’ from the drop-down.